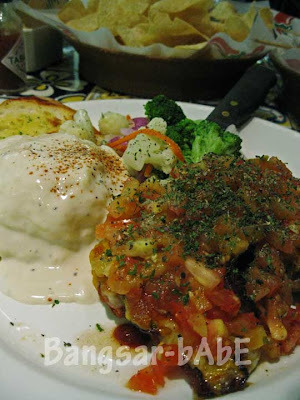 Not too long ago, rif and I had dinner at Chili’s, Bangsar Shopping Centre. On a weekday night, the place was less of a ruckus than on weekends (thank goodness!). 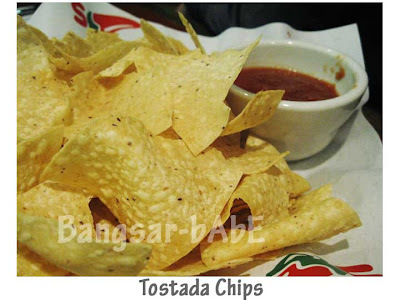 For starters, we ordered the Tostada Chips (RM9.95 with free re-fills). The chips were lightly salted and the bowl of salsa sauce was tangy and slightly spicy. We added a liberal amount of tobasco sauce and black pepper to make it spicier. rif’s Cajun Club Sandwich (RM22.95) was huge. Grilled chicken breast, ham slices, savoury bacon stripes and cheese slices between toasted sandwich bread, it was good stuff! The thick cut chips were freshly fried. Best dipped in chili and tobasco sauce. Yum! 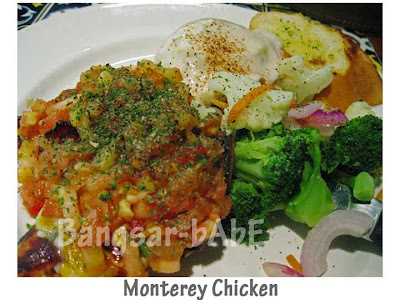 My Monterey Chicken (RM24.95) was well-marinated and grilled just right. Topped with smoked bacon, cheese, chopped tomatoes and BBQ sauce, it comes with a side of mash potatoes and seasonal veggies. The mash potato was delicious. Mashed with bits of potato skin, it has a buttery overtone. The cheesy gravy makes the whole combination so moreish! All in, the dinner cost us RM72.50 inclusive of a coke, service charge and tax. We enjoyed our meal and the not-so-noisy ambiance that night was great for catching up. Verdict: Try the their burgers and grilled selection!